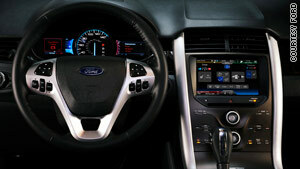 Ford says new technology will include Twitter feeds read to drivers. It also has a partnership with Pandora, Stitcher. Company says they are just taking what people already do "and make them safer"
Las Vegas, Nevada (CNN) -- The debate over distracted drivers ramped up a notch on Thursday as Ford Motor Co. announced technology to let computers read their Twitter feeds to them while behind the wheel. The company has not formally announced technology to let drivers post tweets verbally from behind the wheel, but such an announcement likely will come in the next 12 to 18 months, Doug VanDagens, Ford's global director of connected services, told CNN in an interview after the company's keynote address at the Consumer Electronics Show here. VanDagens said people read Twitter feeds and send text messages while they're driving anyway, and that the automaker is trying to make those activities safer for drivers. Safety groups have criticized car companies and technology makers for putting touch-screen devices that surf the Internet in cars. The U.S. is in a distracted driving crisis, and, in general, the more technology electronics makers put into cars, the less drivers are able to pay attention to the road, said Christie Hype, a spokeswoman for AAA, the motor safety group. "The more things that are going on in a vehicle, the more things can distract a driver," she said. "You only have so much attention to give, and we really want everyone to keep their attention on the roadway for safety reasons." Ford's system, which will be installed in some cars later this year, does not let drivers surf the Internet visually while driving. A Wi-Fi hot spot in the new cars generate will let drivers browse the Web when their cars are parked, VanDagens said. The technologies will first show up in Edge and Focus model cars. Not all models will be upgraded in 2010, but new lines of these cars will be equipped with the media-center technology, which features an 8-inch screen in the center of the dash and a media hookup under the armrest. A company representative would not comment on whether the technology will increase the price of Ford cars. Ford's announcement also highlights the growing popularity and importance of mobile phone applications. Instead of downloading Twitter feeds through the car, Ford works with drivers' mobile phones, pulling data from a number of apps, which are produced by other companies. The Twitter-reading function works with a Twitter mobile app called Open Beak. The car company also announced partnership with Pandora's mobile app, which streams music, and Stitcher, an application for online news.